The project I'm sharing today is the opposite of "if you build it they will come" but rather if they come, you will build it. 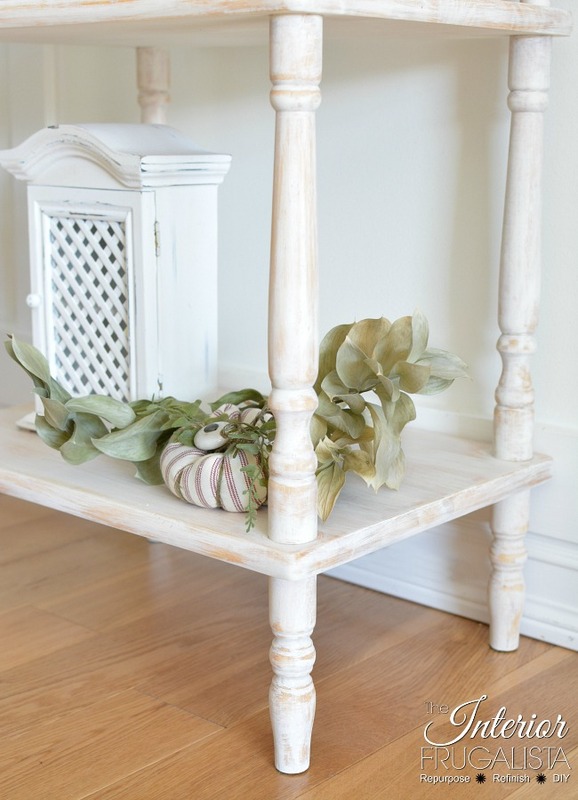 Over the last year, the exact same two-tiered turned leg oak table has landed on my doorstep from multiple sources. It's like the first little table put the word out that the Frugalista lady has opened her doors to them but their respective owners didn't collectively know it. Whats a girl to do when she finds herself with four identical tables? 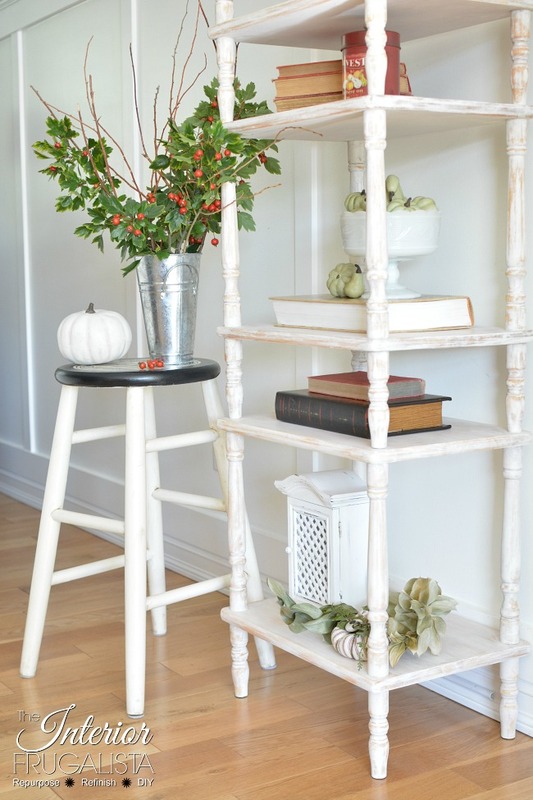 Turn them into a Farmhouse Etagere Bookcase I say! 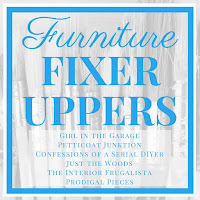 Before I get into the details of this Etagere Bookcase, today is Furniture Fixer Uppers day, one of my favorite days of the month. 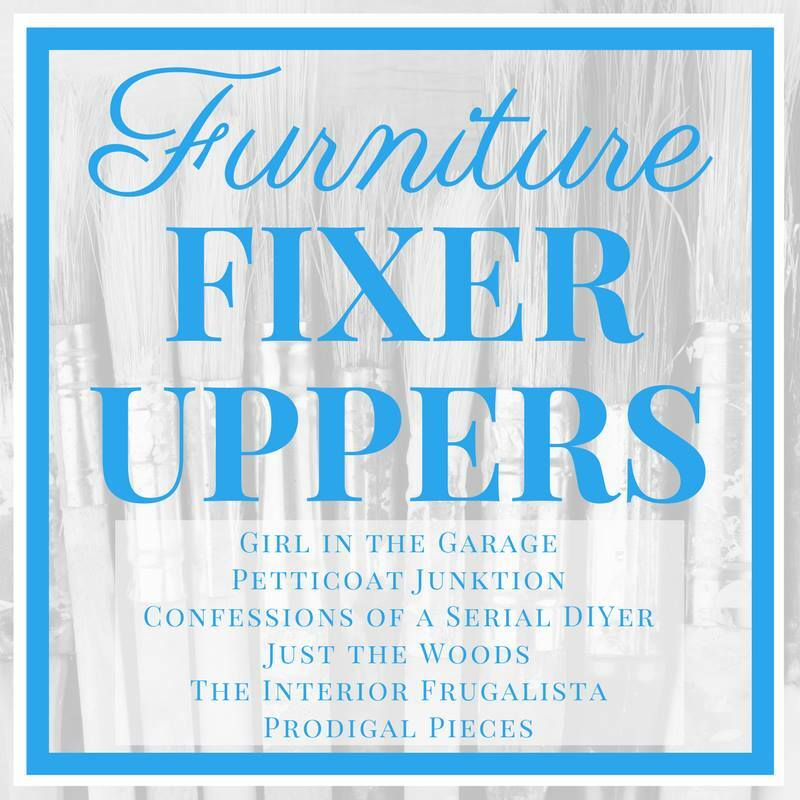 Six talented and creative bloggers come together to breathe new life into six furniture pieces that had seen better days. 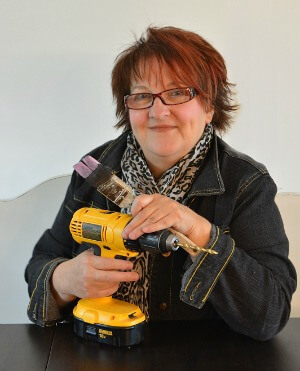 You will find links to my friend's furniture makeovers at the bottom of this post. In case you missed last months challenge, I went all glam with a Vintage Student Desk fit for a princess. These are the tables, the one in the foreground on the top is ever so slightly different and I ended up not using it because it made the bookcase too tall. As it is, the bookcase stands 5-feet tall with just the three tables. First I gave the tables a good scrub with vinegar and water. They had a glossy finish and so in order to give the paint some bite, I lightly sanded them all with a mouse sander and 150-grit sanding pad. 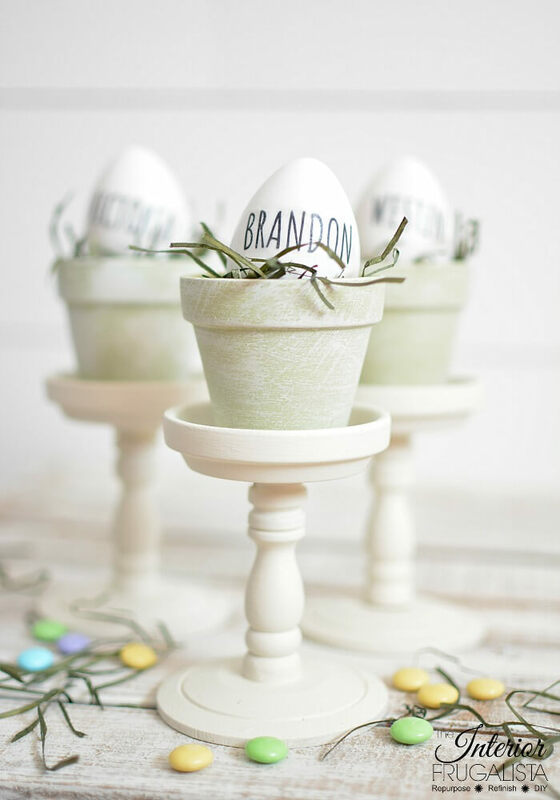 That was the most labor-intensive part of this project. Disclosure: This post contains affiliate links so you can see what products I used or recommend to complete this project. 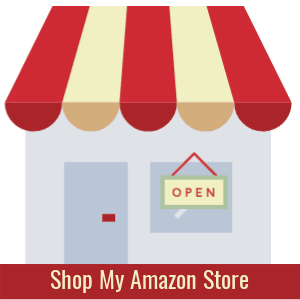 What that means is that if you click on one of the product links, I may receive a small portion of any sales at no additional cost to you to support the costs of running this site. See my disclosure policy page. Materials list included at the bottom of this post. 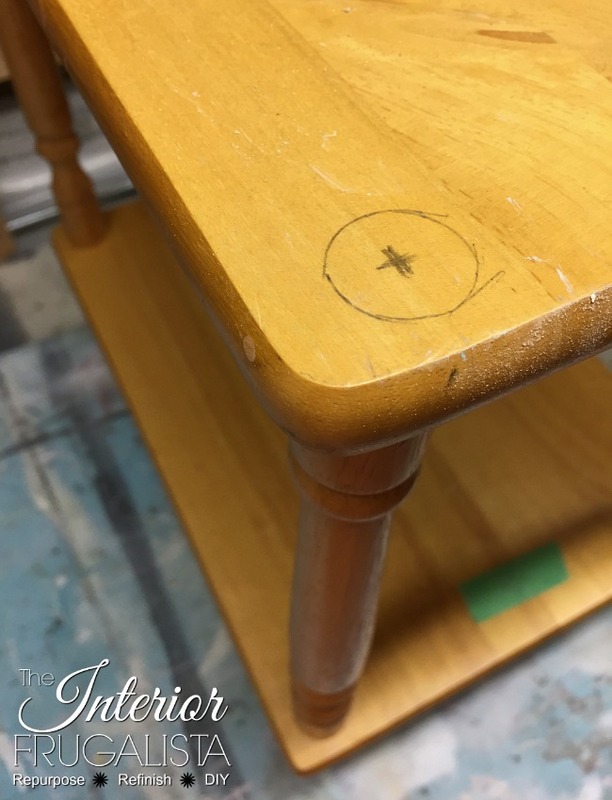 On the middle and top tables ONLY, find the center point on each leg and mark with a pencil (pictured above). 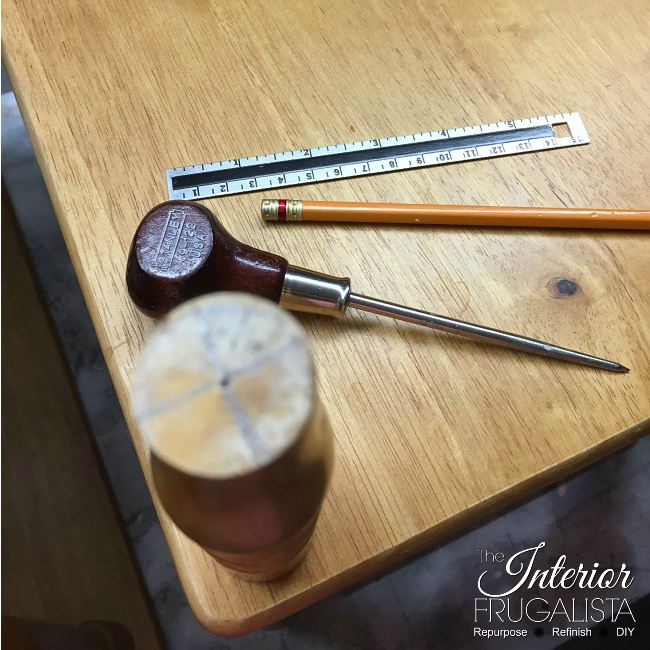 Using an Awl, puncture a pilot hole in the center of the legs (pictured above). Wrap a piece of tape around a ¾-inch Forstner Bit at a ¾-inch depth. 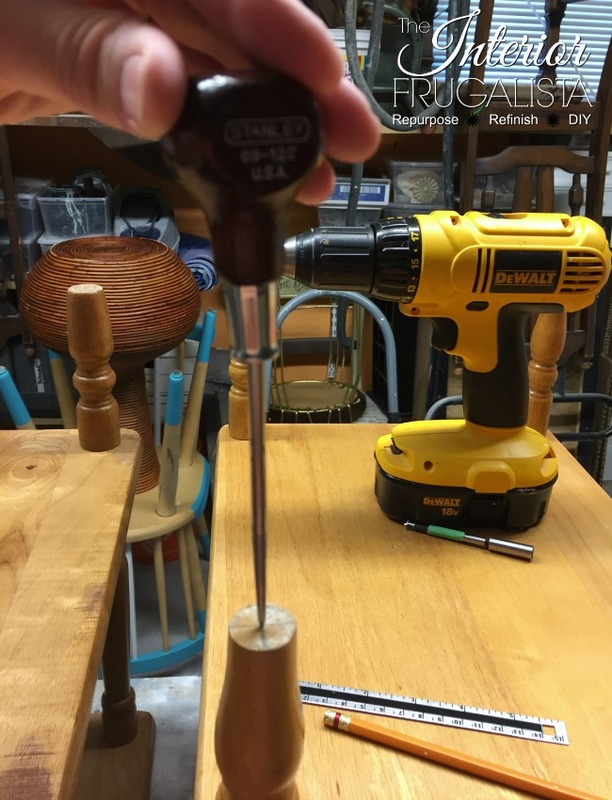 Drill a hole the depth of the tape to accommodate wooden connector dowels (pictured above). Flip the table right side up and stack table #2 on top of the bottom table and align them centered on top of one another. Draw a pencil mark around each leg (pictured below). Stack table #3 on top of table #2 and repeat the steps above. 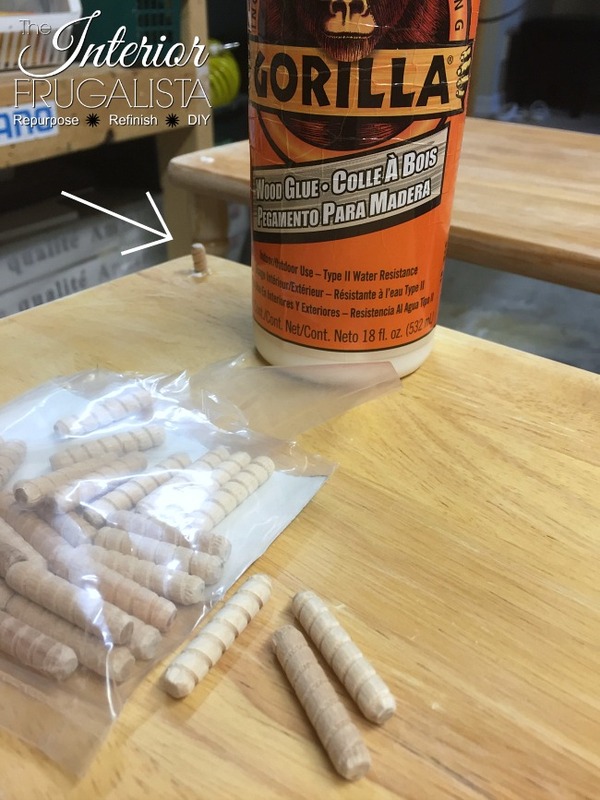 Squeeze wood construction glue into the holes on the legs and insert the wooden dowels (pictured below). You may need to use a hammer. 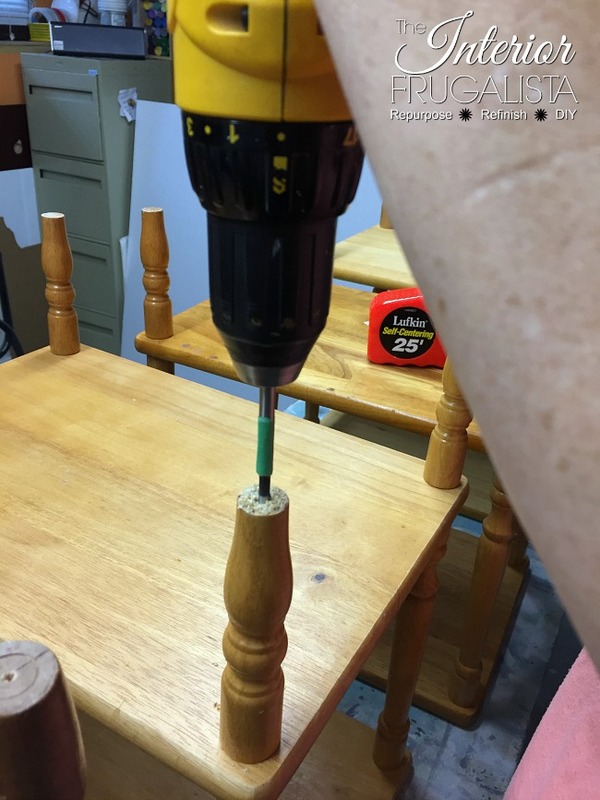 Squeeze wood construction glue into the holes on the table tops and align the dowels to connect the tables. Wipe excess glue with a damp cloth and clamp overnight (pictured below). Now the fun part, making them pretty. Brushing turned legs, especially in multiples, is a pain in the neck so the plan going in was to use my paint sprayer. Unfortunately, our weather has been hovering around the 2°C range so spraying furniture outside is no longer an option. 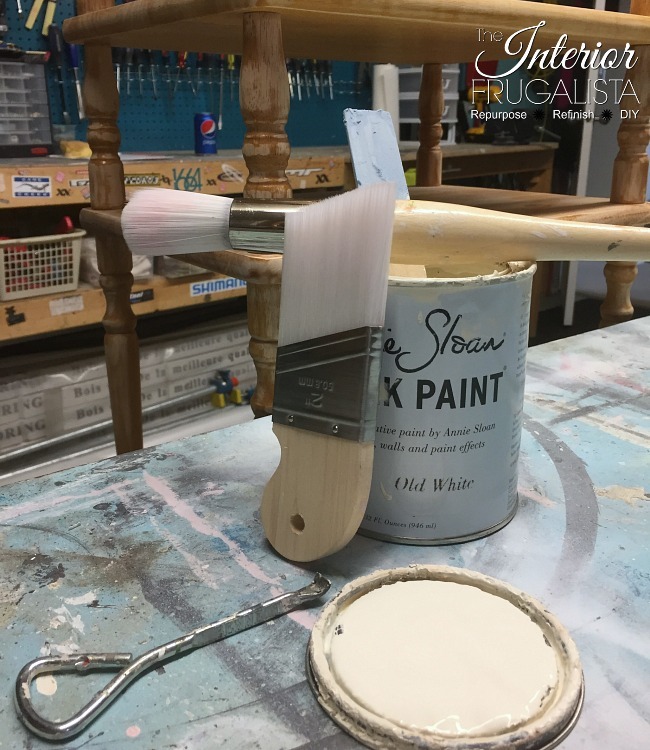 If you have no choice but to use a brush, the job is much quicker and easier when using a good quality synthetic round brush (pictured above). The shallower shelves on the Etagere were a tight squeeze and so my short stubby palm pro angled paintbrush made the job much easier. 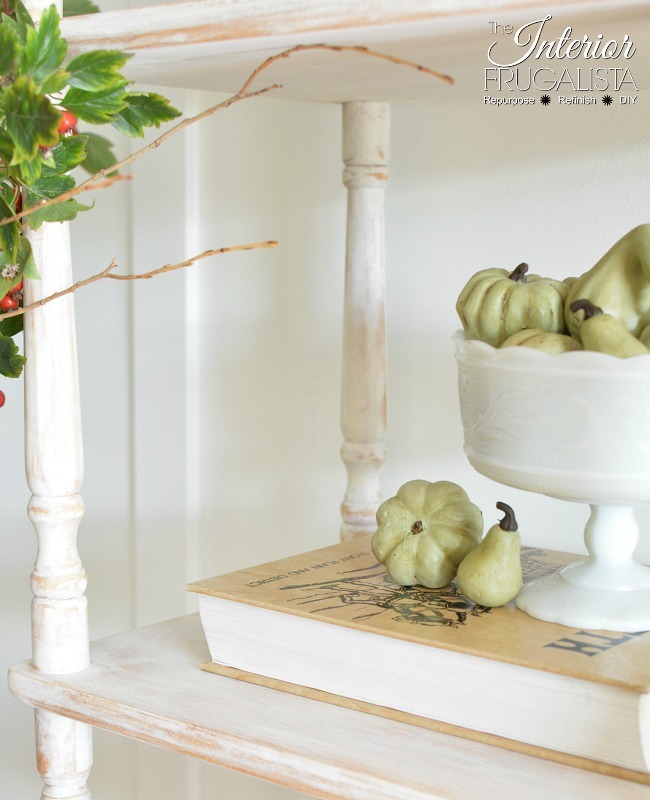 The bookcase was painted with just one coat of Anne Sloan Chalk Paint in the color Old White. To reveal more of the light oak underneath the edges were sanded with 220 grit sandpaper. After brushing clear wax the contrast between the white and natural wood popped. The wax was buffed to a matte finish. 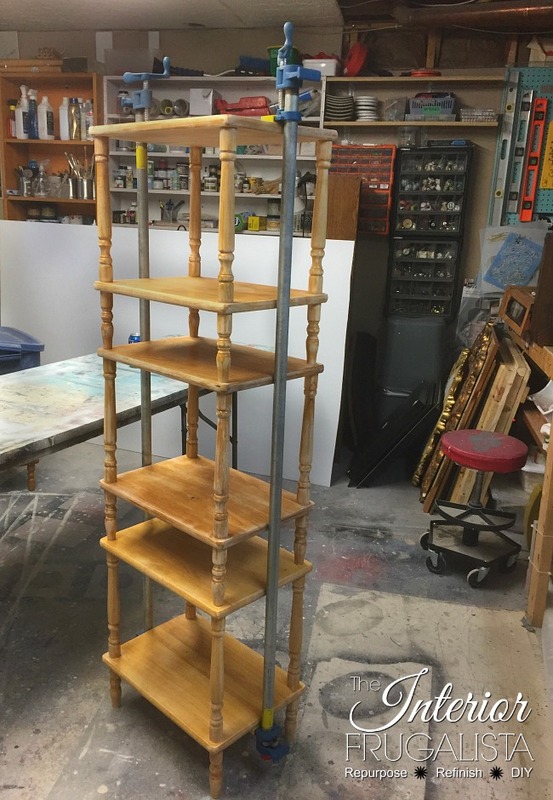 I styled it as a living room bookcase but I could see it in a Farmhouse kitchen to hold a mixer and baking supplies, or a bathroom for toiletries and rolled towels, a craft/sewing room or home office. 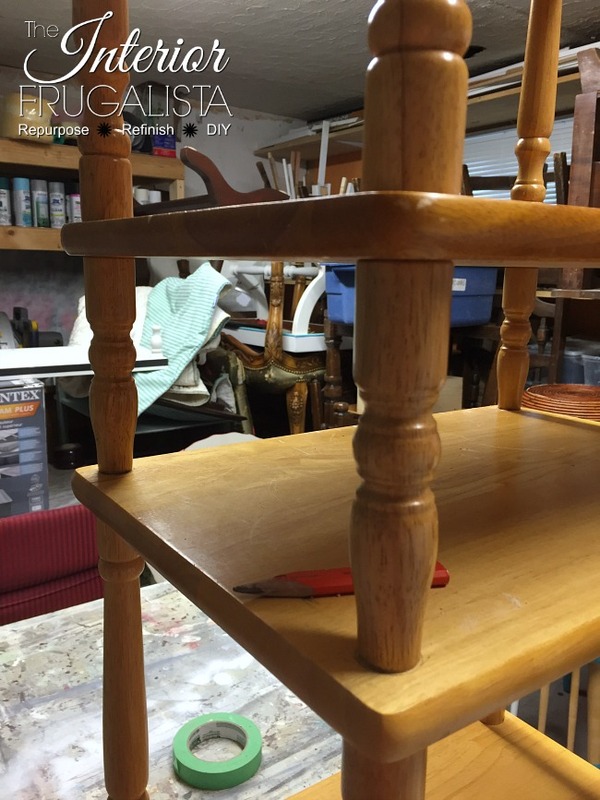 If you're wondering about the stool in the photo. Being the Mother of seven children, many a potato was peeled and dish washed on that stool. I claimed it before heading to the donation pile and gave Mom's Stool A Befitting Makeover. 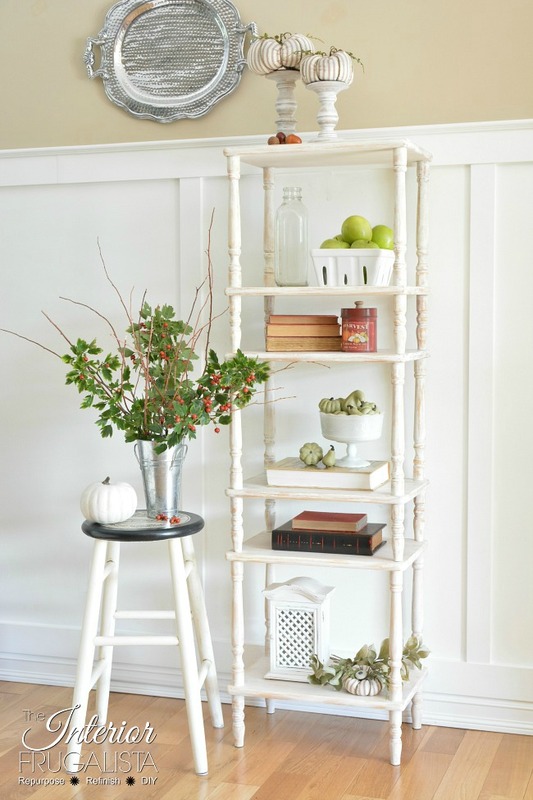 Adding chunky wooden candlesticks onto the top give the bookcase just the right amount of height. Instead of candles, I decorated them with pumpkins for Fall. 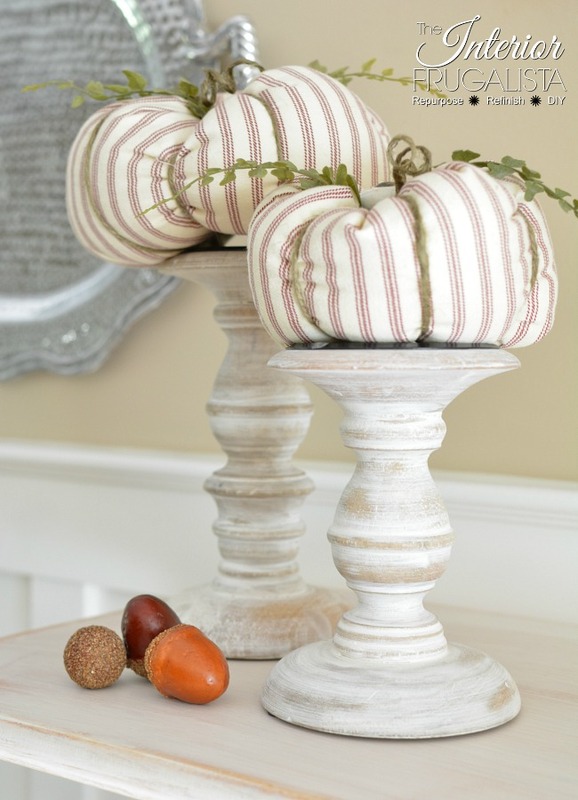 If you'd like to see how I made them you can find both a video and written tutorial in my post Fabric Pumpkins With Cabinet Knob Stems. 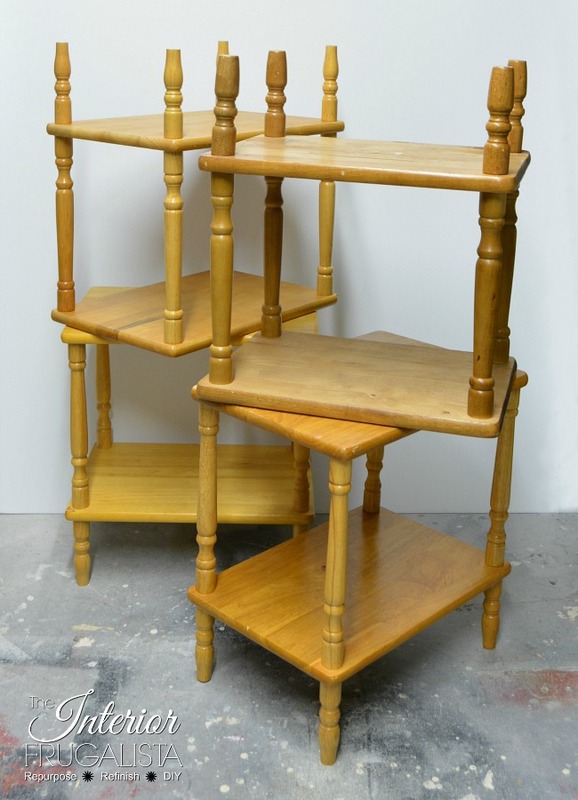 Thank goodness for multiples, it's like these tables lined up on my doorstep because they had dreams of becoming a bookcase one day. 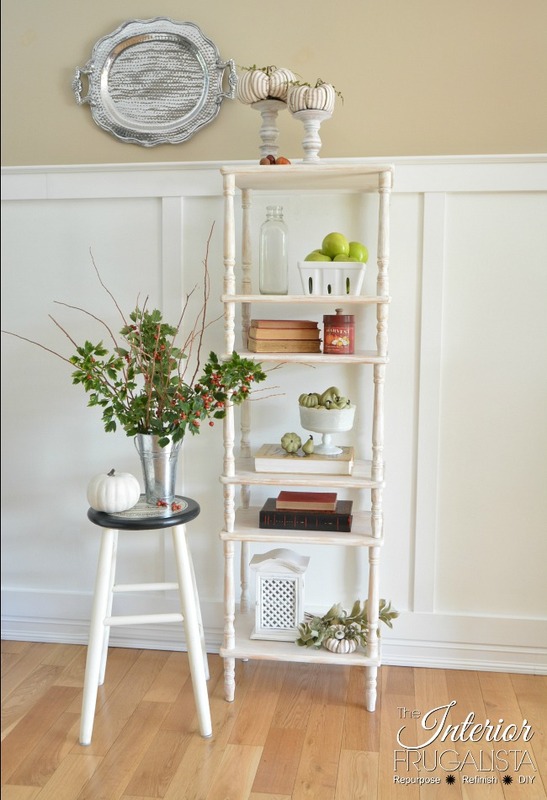 As much as I'd like to keep this Farmhouse Etagere Bookcase, it'll be heading to my booth soon. Oh, and as for the odd man table out, it has been dismantled and the shelves will be morphed into signs and the turned legs repurposed on several future projects. Nothing goes to waste around here. 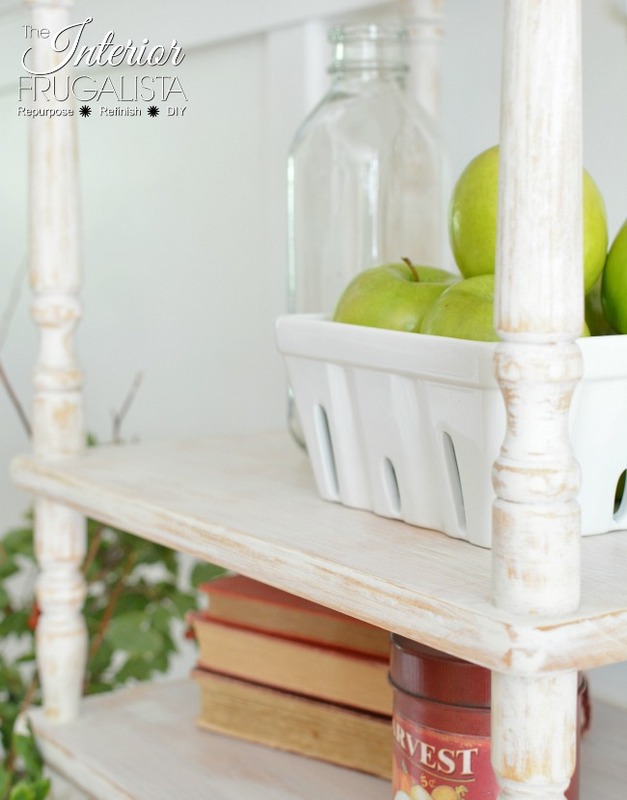 If you found this tiered table repurpose inspiring, please share it with a friend and/or save it on Pinterest. 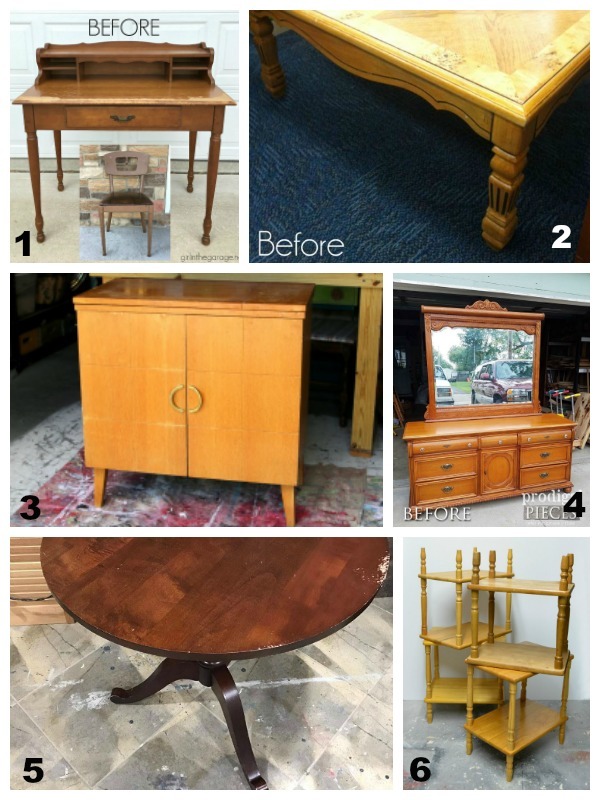 I'm so excited to see what my talented Furniture Fixer Upper friends did with these furniture pieces. Thank you! I'm glad you find my projects helpful.